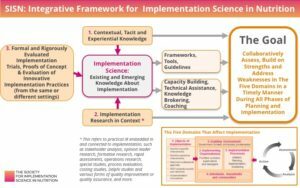 In our March Feature Article “The Many Forms and Purposes of Implementation Research in Nutrition: Definitions, Domains and Distinctions for Advancing Research and Practice” we shared SISN’s conceptual thinking and recent efforts to develop a common understanding of the scope and breadth of implementation in nutrition. During the subsequent months, we have integrated these concepts into two practical tools which we hope can be used to advance implementation knowledge over time. 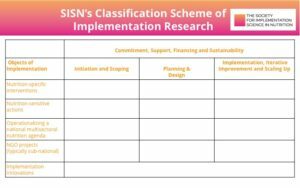 Through a series of communication activities including blogs, a webcast, social media posts and conference presentations, we have disseminated these tools; a classification scheme for implementation research (IR) and an integrative framework for implementation science (IS), and encouraged feedback from our members and supporters. We thank those of you who engaged in this conversation, and we listened carefully to your comments. In response, we have made some adjustments to our framework and classification scheme, including visual format and wording. These improvements will help ensure that we accurately represent and communicate our concepts to all stakeholder groups. The contextual and experiential knowledge of researchers, policy-makers, implementers and others working in this field is diverse and thus an individual’s understanding of implementation and IS is dependent on their unique perspective working within their specific environment. It is important that all stakeholders, regardless of their background or role, can identify where they reside within the wide implementation and IS space, as well as appreciating where other stakeholders operate, and how this intersects with their own role. 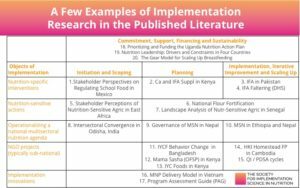 To that end, this article continues our efforts to characterize implementation in nutrition by describing these two tools and how they can be applied in practice. There are many forms and purposes of IR, which often are not recognized as such, and this is a major source of confusion. To address this, SISN developed a classification scheme for IR (Figure 1). The classification scheme is formatted as a table with 5 different objects of implementation populating the rows and 4 different points in the overall implementation process populating the columns. The resulting matrix can be populated with examples, some of which are shown in the Figure 2, to illustrate how various forms of research, assessments, consultations and inquiries can be undertaken in order to inform or strengthen various decisions and processes throughout the implementation cycle. Commitment, Support, Financing and Sustainability: these are cross-cutting governance functions that require diverse methods for stakeholder analysis, assessment of advocacy needs and opportunities, costing, capacity assessments and coordination, among others. Planning and Design: these decisions and processes can be informed by diverse forms of formative research and consultations (at multiple scales/administrative levels) to guide the detailed design of policies/ programs/interventions and development of detailed implementation guidelines, ideally guided by explicit Program Impact Pathways (PIPs) or Theories of Change. Implementation, Iterative Improvement and Scaling Up: these processes can be informed and strengthened through diverse forms of operations research, special studies, process evaluation, quality improvement/quality assurance schemes and monitoring and evaluation systems. Numerous examples of IR in nutrition already exist. We are currently completing a narrative review of such case studies, with the objective of populating the classification scheme with examples. To date we have identified over 100 studies in the published literature. Figure 2 highlights some of these and demonstrates where they reside within the classification scheme. For your reference, the citations associated with these case studies can be accessed here. Testing the feasibility of implementation delivery programs involving education on feeding practices in children 6 to 23 months together with the provision of vouchers for micronutrient powders (MNP) in Mozambique. A 3-year program illustrating the importance of initiation and scoping in IR. Improving the design and delivery of subsidized sales of MNPs linked to education on IYCF in Bangladesh. A 7-year program illustrating the importance of planning and design in IR. Estimating program potential, impact and redesign of a conditional cash transfer program in Mexico (The Progresa, Oportunidades, and Prospera Studies). A 20-year program illustrating the importance of implementation, improvement and scaling up efforts in IR. Dr. Neufeld’s presentation including a detailed description of these examples and reflections on key learnings can be viewed here. In our previous article we aimed to define ‘implementation’ and clarify the distinction between IR and IS. Our classification scheme (Figure 1) builds on this thinking by providing a useful tool to help identify the different forms and purposes of IR, but does not facilitate our understanding of what IS is or isn’t. This is another source of confusion, or at least lack of clarity, and the distinction has major implications. We therefore sought to create a visual representation of the key factors and concepts underlying our thinking on IS (Figure 3). SISN defines IS as “an interdisciplinary body of theory, knowledge, frameworks, tools and approaches whose purpose is to strengthen implementation quality and impact.” This definition explicitly includes both the generation of new knowledge (through various forms of “IR”) and the utilization of existing knowledge (better application of existing knowledge about implementation). Much of this existing knowledge has already been packaged into practical tools, frameworks and guidelines that can be immediately adapted and used in a variety of settings. As such, some of the fruits of “IS” are already available to implementers, but these are often under-utilized. A high priority research agenda, possibly the highest priority from a practitioner’s perspective, is to identify and evaluate ways to make this knowledge more readily available through innovative forms of capacity building, technical assistance, coaching, knowledge brokering and dissemination efforts. Contextual, tacit, and experiential knowledge: the knowledge of barriers, facilitators, strengths and feasibility that implementing practitioners and organizations possess. Contextual implementation research: Varied forms of inquiry that can be applied to any of the five domains noted below (e.g. stakeholder analysis, opinion leader research, formative research, rapid assessments, operations research, special studies, process evaluation, costing studies, Delphi studies and various forms of quality improvement or quality assurance, among others). Formal and rigorously evaluated implementation trials, proofs of concepts, and evaluation of innovative implementation practices. With these conceptual building blocks in mind, we can appreciate SISN’s integrative framework (Figure 3). As shown, the goal is for researchers and practitioners to “collaboratively assess, build on strengths and address weaknesses in the five domains in a timely manner during all phases of implementation”. Achieving this goal has three requirements: First, we must widen our notion of the types of knowledge and information that is needed, going beyond the usual connotations of “research.” Second, we must recognize that implementation problems and bottlenecks can occur because of the characteristics, dynamics and/or lack of fit within and among five domains: 1) the object of implementation, 2) the implementing organizations and staff, 3) the broader enabling environment and stakeholder interests and dynamics, 4) the individuals, households, communities and community actors, as well as 5) implementation strategies and processes. Third, we must recognize that problems and bottlenecks can arise during any stage of the implementation process, as shown in Figure 1. Strengthening capacity of implementing organizations and staff (through training) while neglecting critical bottlenecks in the other four domains. On June 28th, SISN hosted its first webinar where our President, Dr. David Pelletier presented SISN’s integrative framework for IS and engaged In a lively discussion around our conceptual thinking and future application of these tools. You can view the recording of the live webinar here. Have an idea or a comment on any of the issues discussed above? We welcome your feedback – you can comment on this post on our LinkedIn or Twitter feed or write to us using the email address below. Are you actively involved in the implementation of nutrition programs? Please send your case studies of IR to the e-mail below.